The space themed math centers and activity are focused on the skills needed to be able to successfully add and subtract fractions with unlike denominators. Your students will enjoy practicing and learning using these hands-on materials. 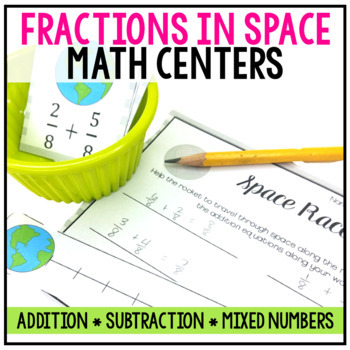 The resource includes 6 centers and a set of fractions vocabulary posters. 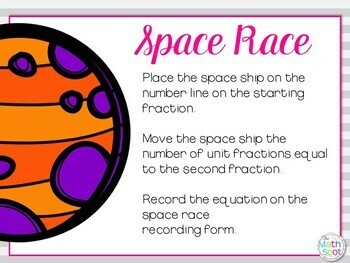 ⭐ Fraction Center #1: Space Race is an activity where students move a space ship along a number line in order to add two fractions with like denominators. A variety of game boards and task cards allow students to work with fraction numbers with different denominators. This is a foundational game which focuses on the 3rd grade standard of recognizing and manipulating fractions on a number line. ⭐ Fraction Center #2: The Equivalent Fraction Sort asks students to sort fractions that are equivalent to ½ and ¼. Students record their sort for accountability. ⭐ Fraction Center #3: In the game Fraction Transformations students use their knowledge of skip counting to find the total number of unit fractions in a mixed number in order to create equivalent fractions. ⭐ Fraction Center #4: The Finding Common Denominators activity again asks students to use their understanding of skip counting to find the least common multiple between two denominators. 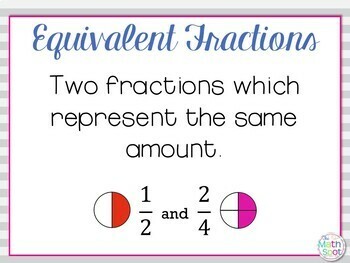 The activity also asks students to use the least common multiple to create two new fractions with common denominators. This is the foundation for adding and subtracting fraction numbers with unlike denominators. ⭐ Fraction Center #5: Mix It Up is a game where students examine an improper fraction and complete a diagram which represents that amount. Students then use their visual representation to name the mixed number they have created. ⭐ Fraction Center #6: Subtraction Task cards have a simple subtraction problem featuring fractions with different denominators and an accompanying recording sheet. 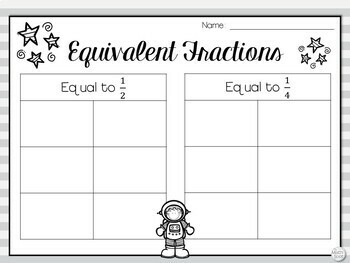 This pack also includes Fraction Posters for a variety of vocabulary terms which are important to understand when completing these stations. Looking for more 5th grade resources?